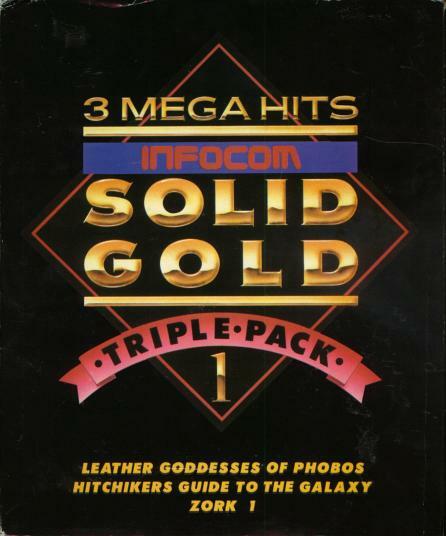 And you thought there were only three slipcased Infocom trilogies! This collection, apparently released at the same time as the individual Solid Gold titles (there's no date on the slipcase) contains Leather Goddesses of Phobos, Hitchhiker's Guide, and Zork I. They're in the usual thin Solid Gold folders, but surrounded by a thin paperboard slipcover, nothing fancy like the grey-box slipcased trilogies. The back has a description of each game and mentions Mediagenic prominently. The games are for IBM PC, though this may have been available for additional platforms. I've only seen one other instance of this package, sold on eBay to a collector in the U.K. Most interesting is the "1" below the title, which obviously indicates an intent to release at least one more collection like this. Too bad only five titles were ever released in the Solid Gold format, one shy of a second triple-pack.